Very often, books about European Art Nouveau do not cite the Netherlands as a major center. I am still wondering why. The wonderful work of the Amsterdam school of architecture in the 1920ies may have eclipse Art Nouveau when at the same time everywhere the Art Nouveau was forgotten or blamed? 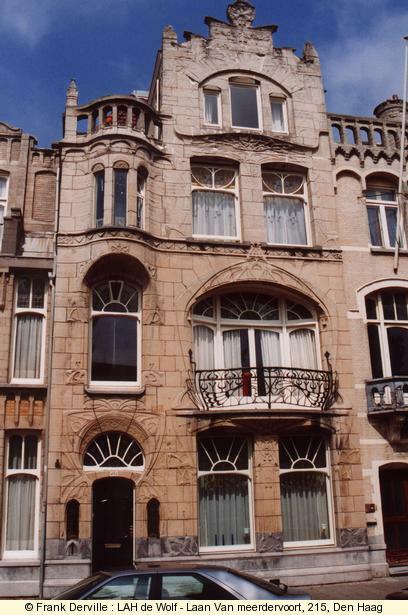 As a matter of fact, many Art Nouveau buildings remain in the Netherlands and Den Haag is one of the european city with the most important number of such buildings. Maybe also no architect as well known as Guimard or Horta? nevertheless you will discover marvels here. 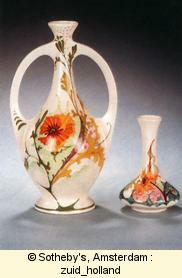 The quality of decorative arts is also stunning. 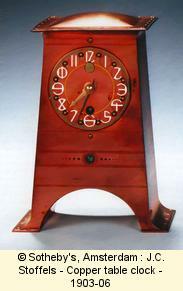 Numerous firms adopted an Art Nouveau (Niewe Kunst in Dutch) design at the end of the 19th century. 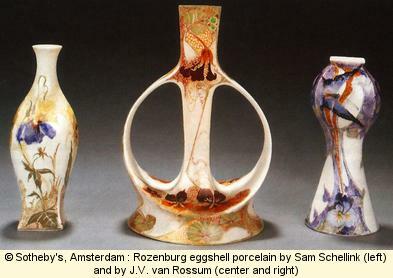 For instance the firm Rozenburg in the Hague (Den Haag) that invented the eggshell porcelain and is well known for its floral designs. 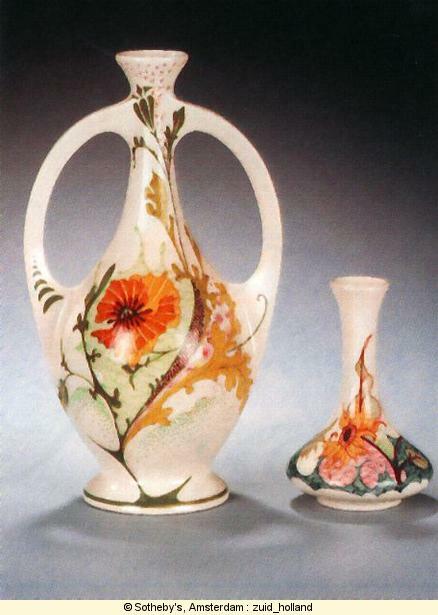 Purmerend, Zuid Holland are also some famous Art Nouveau porcelain firms. The most famous architect is H.P. Berlage, who designed the Amsterdam stock exchange in 1903. Some towns, despite the heavy destruction of the second world war, still keep a large contribution of Art Nouveau to their urban face. The Hague (Den Haag) and its sea side resort Scheveningen. But there are also significant Art Nouveau buildings in Utrecht and Leiden and many other towns in the Netherlands. Art Nouveau in the Netherlands has a attractive personnality. 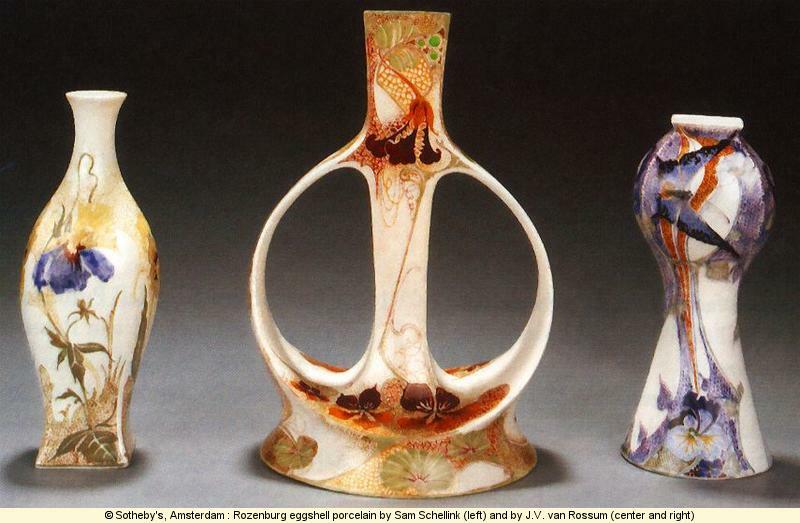 In the 1920ies, the Amsterdam school kept some of the power of the Art Nouveau lines and expressionism. Of course like in other countries, decorative arts are very linked to architecture. But it is worth mentioning the ceramics factory (magnificient egg shell work), the copper work and also the influence of Dutch colonies in the technics (batik for instance), materials (e.g. woods) or designs (e.g. animals). 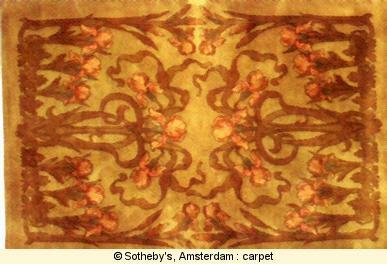 This carpet shows that Art Nouveau wanted to address every object. 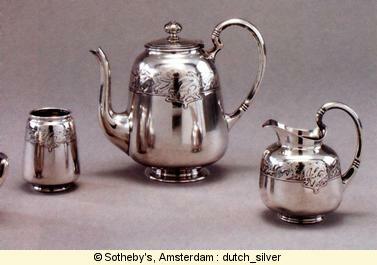 The Art Nouveau style was applied to various crafts including silversmith and wood marketry. 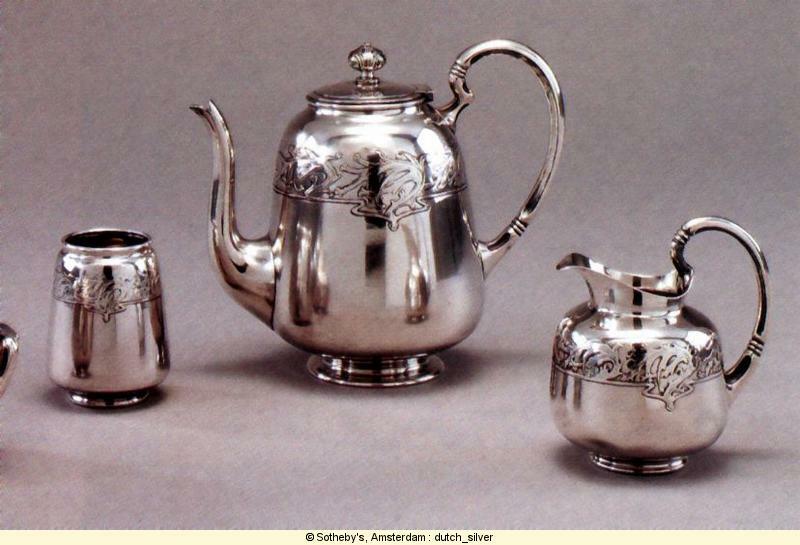 This silver coffee set by A. F. Gips in 1900, with a relatively traditional shape is decorated with a stylized dynamic shape, half animal (lizard) and half vegetal (alga). 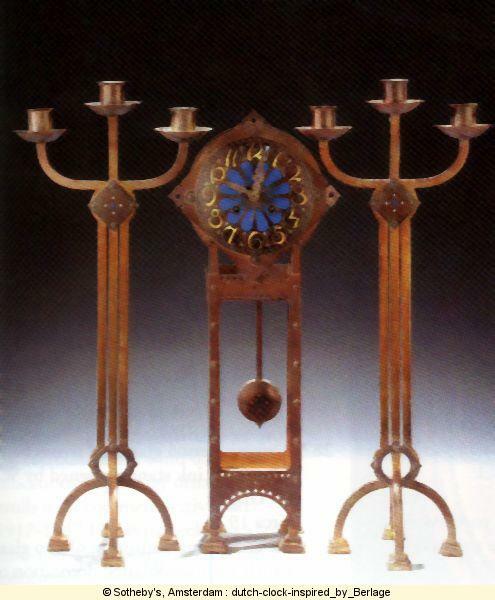 It was first designed for the Paris 1900 world fair. Like in other countries, Art Nouveau architecture integrated a global vision of all crafts contributing to the decoration of the house including the furniture work. 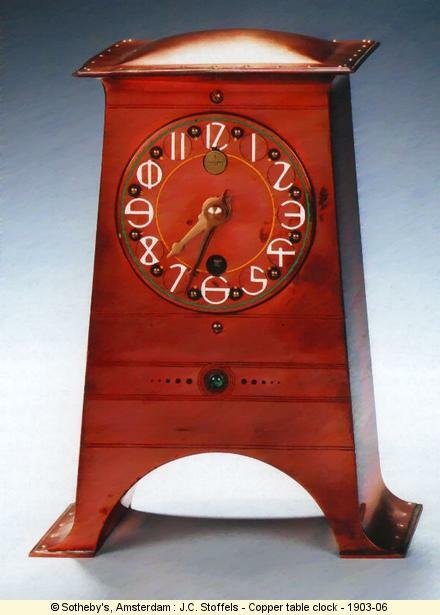 This clock by JC Stoffels (1903-06) is really nice. 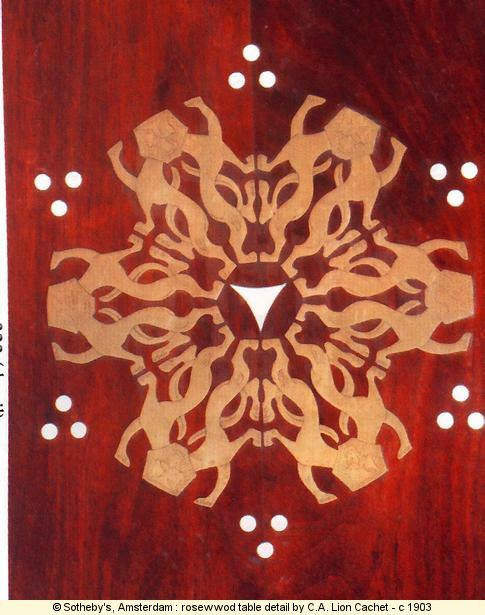 This rosewood, brass and ivory table marketry by C. A. Cachet in 1903 features a round made of 12 stylized lions. Each couple of lions have only one head. African animals (elephants, monkeys, ...) have large place into the Niewe Kunst patterns that is specific in the European Art Nouveau. "De Stille Kracht" was written in 1900 by Louis Couperus. The cover is designed by Chris Lebeau, an important artist of Nieuwe Kunst. In this design two kinds of Art Nouveau existing in Holland are combined, the first being Nieuwe Kunst and the other the international curvilinear style of Art Nouveau. The Nieuwe Kunst aspects of the design lie in the fact that the decoration emphasises the construction of the book: The lines on the back emphasize the yarn with which the book is bound and the decoration on the back and front are kept within rectangles, thus emphasising the rectangular blocks in which the characters are set. Though the decoration itself is abstract and constructed on a framework of chequers the overall appearance is curvilineair. 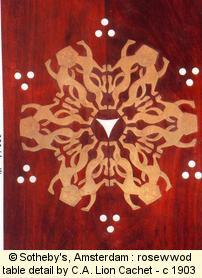 The cover is executed in the batik technique. Batik originally is an Indonesian technique for decorating textiles. The cloth is covered with wax at the places where no colour is wanted. After immersion in a bath with pigment the wax is removed. This proceure is repeated for every colour separately. Batik is one of the techniques which distinguishes Dutch Art Nouveau, although some German artists later also used it. 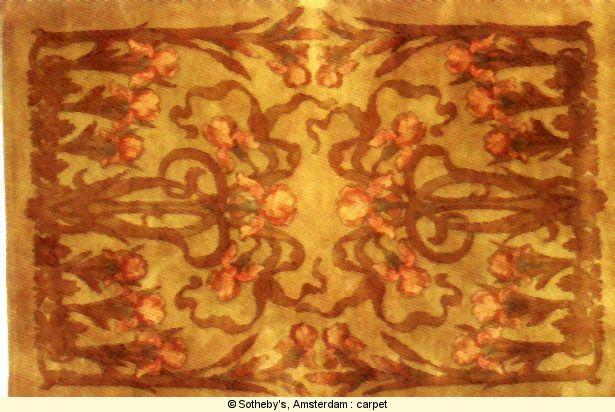 Dutch batiks are different from Indonesian ones in the designs used, and dutch artists also used the technique on different materials than textile, like leather or wood. "In den Nevel" means "In the mist" or "In the nebulae". It is a periodical for students of the Delft University of Technology. Its cover was "drawn" by Jan Toorop in 1895. Originally, it was in fact carved as a woodcut and every year the cover was printed with a different color. Psyche is a book written by Louis Coupertus with a cover by Jan Toorop in 1898. 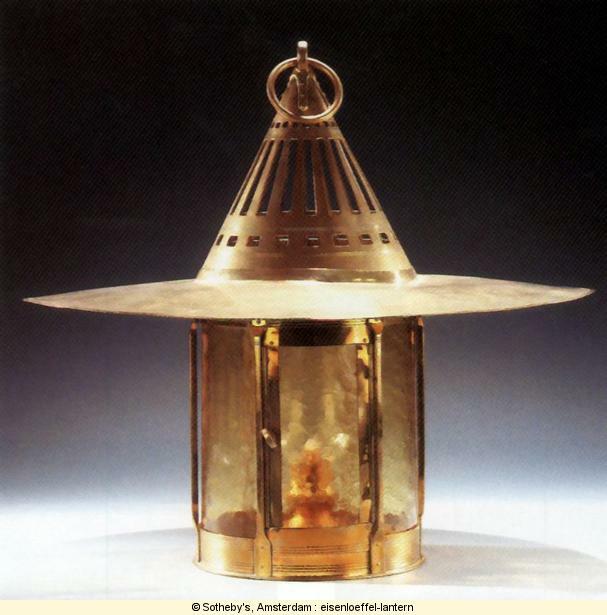 Lantern by Eisenloeffel. 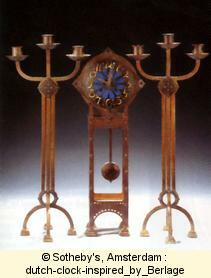 One of my favorite Dutch Art Nouveau artist. Portion copyright (and great thanks) to Arend von Dam. 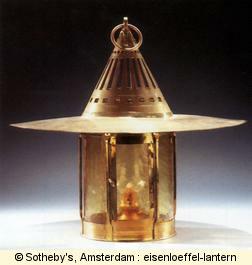 Text and some images; Special acknowledgement to Sotheby's Amsterdam who gave me the permission to use the pictures. More specific links about Amsterdam can be found in the dedicated sections.